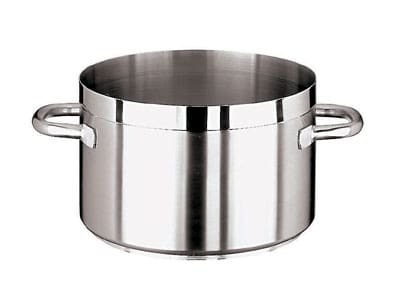 World Cuisine 11107-45 46.5 qt Stainless Sauce Pot - 17.75" X 10.875"
46.5 qt Stainless Sauce Pot - 17.75" X 10.875"
The Paderno 11107-45 Grand Gourmet sauce pot has a beautiful satin polish and a mirror finish on its edges. To reduce the amount of scratches and dings, it is constructed of 18/10 stainless steel, which contains 18 percent chromium and 10 percent nickel. When contacting salty foods, this high nickel value minimizes the risk of corrosion. This pot has a 461⁄2-quart capacity, and its upper edges are sturdy, preventing any bends. A three-layer base consisting of one layer of aluminum sandwiched between two layers of stainless steel ensures the pot heats efficiently. Durable stainless steel rests on the stove and keeps the top layer from cooling. In the middle, aluminum helps correct hot spots that may develop from the stainless steel. Not sure which material would work best for your kitchen? Take a look at our cookware explainer article to learn more about them.